As the great research ship Chikyu left Shimizu in January to mine the explosive ice beneath the Philippine Sea, chances are good that not one of the scientists aboard realized they might be closing the door on Winston Churchill’s world. Their lack of knowledge is unsurprising; beyond the ranks of petroleum-industry historians, Churchill’s outsize role in the history of energy is insufficiently appreciated. Winston Leonard Spencer Churchill was appointed First Lord of the Admiralty in 1911. With characteristic vigor and verve, he set about modernizing the Royal Navy, jewel of the empire. The revamped fleet, he proclaimed, should be fueled with oil, rather than coal—a decision that continues to reverberate in the present. Burning a pound of fuel oil produces about twice as much energy as burning a pound of coal. Because of this greater energy density, oil could push ships faster and farther than coal could. Churchill’s proposal led to emphatic dispute. The United Kingdom had lots of coal but next to no oil. At the time, the United States produced almost two-thirds of the world’s petroleum; Russia produced another fifth. Both were allies of Great Britain. Nonetheless, Whitehall was uneasy about the prospect of the Navy’s falling under the thumb of foreign entities, even if friendly. The solution, Churchill told Parliament in 1913, was for Britons to become “the owners, or at any rate, the controllers at the source of at least a proportion of the supply of natural oil which we require.” Spurred by the Admiralty, the U.K. soon bought 51 percent of what is now British Petroleum, which had rights to oil “at the source”: Iran (then known as Persia). The concessions’ terms were so unpopular in Iran that they helped spark a revolution. London worked to suppress it. Then, to prevent further disruptions, Britain enmeshed itself ever more deeply in the Middle East, working to install new shahs in Iran and carve Iraq out of the collapsing Ottoman Empire. Churchill fired the starting gun, but all of the Western powers joined the race to control Middle Eastern oil. Britain clawed past France, Germany, and the Netherlands, only to be overtaken by the United States, which secured oil concessions in Turkey, Iraq, Bahrain, Kuwait, and Saudi Arabia. The struggle created a long-lasting intercontinental snarl of need and resentment. Even as oil-consuming nations intervened in the affairs of oil-producing nations, they seethed at their powerlessness; oil producers exacted huge sums from oil consumers but chafed at having to submit to them. Decades of turmoil—oil shocks in 1973 and 1979, failed programs for “energy independence,” two wars in Iraq—have left unchanged this fundamental, Churchillian dynamic, a toxic mash of anger and dependence that often seems as basic to global relations as the rotation of the sun. All of this was called into question by the voyage of the Chikyu (“Earth”), a $540 million Japanese deep-sea drilling vessel that looks like a billionaire’s yacht with a 30-story oil derrick screwed into its back. The Chikyu, a floating barrage of superlatives, is the biggest, glitziest, most sophisticated research vessel ever constructed, and surely the only one with a landing pad for a 30-person helicopter. The central derrick houses an enormous floating drill with a six-mile “string” that has let the Chikyu delve deeper beneath the ocean floor than any other ship. The Chikyu, which first set out in 2005, was initially intended to probe earthquake-generating zones in the planet’s mantle, a subject of obvious interest to seismically unstable Japan. Its present undertaking was, if possible, of even greater importance: trying to develop an energy source that could free not just Japan but much of the world from the dependence on Middle Eastern oil that has bedeviled politicians since Churchill’s day. In the 1970s, geologists discovered crystalline natural gas—methane hydrate, in the jargon—beneath the seafloor. Stored mostly in broad, shallow layers on continental margins, methane hydrate exists in immense quantities; by some estimates, it is twice as abundant as all other fossil fuels combined. Despite its plenitude, gas hydrate was long subject to petroleum-industry skepticism. These deposits—water molecules laced into frigid cages that trap “guest molecules” of natural gas—are strikingly unlike conventional energy reserves. Ice you can set on fire! Who could take it seriously? But as petroleum prices soared, undersea-drilling technology improved, and geological surveys accumulated, interest rose around the world. The U.S. Department of Energy has been funding a methane-hydrate research program since 1982. Nowhere has the interest been more serious than Japan. Unlike Britain and the United States, the Japanese failed to become “the owners, or at any rate, the controllers” of any significant amount of oil. (Not that Tokyo didn’t try: it bombed Pearl Harbor mainly to prevent the U.S. from blocking its attempted conquest of the oil-rich Dutch East Indies.) Today, Churchill’s nightmare has come true for Japan: it is a military and industrial power almost wholly dependent on foreign energy. It is the world’s third-biggest net importer of crude oil, the second-biggest importer of coal, and the biggest importer of liquefied natural gas. Not once has a Japanese politician expressed happiness at this state of affairs. Japan’s methane-hydrate program began in 1995. Its scientists quickly focused on the Nankai Trough, about 200 miles southwest of Tokyo, an undersea earthquake zone where two pieces of the Earth’s crust jostle each other. Step by step, year by year, a state-owned enterprise now called the Japan Oil, Gas, and Metals National Corporation (JOGMEC) dug test wells, made measurements, and obtained samples of the hydrate deposits: 130-foot layers of sand and silt, loosely held together by methane-rich ice. The work was careful, slow, orderly, painstakingly analytical—the kind of process that seems intended to snuff out excited newspaper headlines. But it progressed with the same remorselessness that in the 1960s and ’70s had transformed offshore oil wells from Waterworld-style exoticisms to mainstays of the world economy. Already the petroleum industry has been convulsed by hydraulic fracturing, or “fracking”—a technique for shooting water mixed with sand and chemicals into rock, splitting it open, and releasing previously inaccessible oil, referred to as “tight oil.” Still more important, fracking releases natural gas, which, when yielded from shale, is known as shale gas. (Petroleum is a grab-bag term for all nonsolid hydrocarbon resources—oil of various types, natural gas, propane, oil precursors, and so on—that companies draw from beneath the Earth’s surface. The stuff that catches fire around stove burners is known by a more precise term, natural gas, referring to methane, a colorless, odorless gas that has the same chemical makeup no matter what the source—ordinary petroleum wells, shale beds, or methane hydrate.) Fracking has been attacked as an environmental menace to underground water supplies, and may eventually be greatly restricted. But it has also unleashed so much petroleum in North America that the International Energy Agency, a Paris-based consortium of energy-consuming nations, predicted in November that by 2035, the United States will become “all but self-sufficient in net terms.” If the Chikyu researchers are successful, methane hydrate could have similar effects in Japan. And not just in Japan: China, India, Korea, Taiwan, and Norway are looking to unlock these crystal cages, as are Canada and the United States. Not everyone thinks JOGMEC will succeed. But methane hydrate is being developed in much the same methodical way that shale gas was developed before it, except by a bigger, more international group of researchers. Shale gas, too, was subject to skepticism wide and loud. The egg on naysayers’ faces suggests that it would be foolish to ignore the prospects for methane hydrate—and more foolish still not to consider the potential consequences. If methane hydrate allows much of the world to switch from oil to gas, the conversion would undermine governments that depend on oil revenues, especially petro-autocracies like Russia, Iran, Venezuela, Iraq, Kuwait, and Saudi Arabia. Unless oil states are exceptionally well run, a gush of petroleum revenues can actually weaken their economies by crowding out other business. Worse, most oil nations are so corrupt that social scientists argue over whether there is an inherent bond—a “resource curse”—between big petroleum deposits and political malfeasance. It seems safe to say that few Americans would be upset if a plunge in demand eliminated these countries’ hold over the U.S. economy. But those same people might not relish the global instability—a belt of financial and political turmoil from Venezuela to Turkmenistan—that their collapse could well unleash. On a broader level still, cheap, plentiful natural gas throws a wrench into efforts to combat climate change. Avoiding the worst effects of climate change, scientists increasingly believe, will require “a complete phase-out of carbon emissions … over 50 years,” in the words of one widely touted scientific estimate that appeared in January. A big, necessary step toward that goal is moving away from coal, still the second-most-important energy source worldwide. Natural gas burns so much cleaner than coal that converting power plants from coal to gas—a switch promoted by the deluge of gas from fracking—has already reduced U.S. greenhouse-gas emissions to their lowest levels since Newt Gingrich’s heyday. A few years after I graduated from college, I drove with a friend to Southern California, a place I’d never been. I saw a little of Los Angeles, then went north and spent a few days bumbling through the San Joaquin Valley. Going about Bakersfield one night, I got hopelessly lost and ended up at a chain-link fence. Behind the fence were thousands of oil pumps, nodding up and down like so many giant plastic drinking birds. Enshrouding the pumps was a spiderweb of pipes and electrical wires, vast and complex beyond reason, lights and machinery stretching out across the desert farther than I could see. A giant, hypermodern petroleum operation barely 100 miles from Los Angeles! I couldn’t believe it. As I stood gawping, a policeman drove by. I asked him when this complex had sprung up. He looked at me like I was an idiot. “They’ve been drilling here since 1899,” he said. I was standing by the Kern River oil field, one of the best-known petroleum deposits in the United States. Because I had somehow missed geology in school, I had been left with the vague idea that oil is found in big subterranean pools, like the underground lake where Voldemort conceals part of his soul in the Harry Potter series. In fact, petroleum is usually contained in solid sandstone or limestone strata, which are riddled, spongelike, with minute pores. Or it can occur in thin sheets between layers of shale. Looking at the nodding wells, I had the notion that they were drawing a uniform substance from the ground, a black liquid like the inky water in Voldemort’s lake. Instead, petroleum occurs as a crazy stew of different compounds: oil of various grades mixed with methane, ethane, propane, butane, and other hydrocarbons. Squashed into stone hundreds or thousands of feet underground, this jumble of liquid and gas is usually under great pressure. Layers, or “caps,” of impermeable rock prevent it from seeping to the surface. When drilling bores through the caps, petroleum shoots up in orthodox gusher fashion. For a long time, companies collected oil and discarded the methane that burbled up with it, often by burning the gas in a cinematic flare atop special derricks, or even simply dumping it into the atmosphere. People did use natural gas for energy—gaslights have existed since the days of Jane Austen—but transporting it was costly. Unlike liquid oil, which could be poured into containers and carried on a railroad network that had already been built and paid for by somebody else, gaseous methane had to be pumped through sealed tubes to its destination, which required energy firms and utilities to lay thousands upon thousands of miles of pipeline. Not until the Second World War and war-production advances in welding did this effort gather speed. (Methane can be cooled into a liquid and transported in pressurized tanks that are loaded and unloaded in special facilities, but this is also expensive.) Oil from wells in Texas is readily dispatched via tanker to Europe or Asia, but even today, natural gas from the same wells is often effectively limited to use in the United States. From the beginning, it was evident that the Kern River field was rich with oil, millions upon millions of barrels. (A barrel, the unit of oil measurement, is 42 gallons; depending on the grade, a ton of oil is six to eight barrels.) Wildcatters poured into the area, throwing up derricks, boring wells, and pulling out what they could. In 1949, after 50 years of drilling, analysts estimated that just 47 million barrels remained in reserves—a rounding error in the oil business. Kern River, it seemed, was nearly played out. Instead, oil companies removed 945 million barrels in the next 40 years. In 1989, analysts again estimated Kern reserves: 697 million barrels. By 2009, Kern had produced more than 1.3 billion additional barrels, and reserves were estimated to be almost 600 million barrels. What does it mean when oil companies say they have so many million barrels in reserves? How much energy is in the ground? When will we begin running out? As the history of the Kern River field suggests, these questions are not easy to answer. Indeed, Ph.D.‑toting experts have bombarded Americans for half a century with totally contradictory responses. On one side, pessimists claim that the planet is slowly running out of petroleum. “Turn down the thermostat!” they cry. “Stuff insulation in your walls!” “Buy a hybrid!” “Conserve!” From the other side come equally loud shouts insisting that there are vast, untapped petroleum deposits in Alaska and Alberta and off the coast of Virginia, that geysers of natural gas exist in the shale beds of Pennsylvania and North Dakota, and that huge oil patches await extraction in the deep ocean. “Drill, baby, drill!” “The end of oil!” Al Gore or Sarah Palin, Cassandra or Pollyanna, which side is right? The back-and-forth would be comical if the stakes didn’t involve the fate of human civilization. When gasoline supplies drop, TV news reporters like to wring their hands at the drivers mobbing the corner Exxon. But the motorists’ panic reflects a basic truth: economic growth and energy use have marched in lockstep for generations. Between 1900 and 2000, global energy consumption rose roughly 17-fold, the University of Manitoba environmental scientist Vaclav Smil has calculated, while economic output rose 16-fold—“as close a link as one may find in the unruly realm of economic affairs.” Petroleum has wreaked all kinds of social and environmental havoc, but a steady supply of oil and gas remains just as central to the world’s economic well-being as it was in Churchill’s day. According to the National Bureau of Economic Research, the United States has experienced 11 recessions since the end of the Second World War. All but one were associated with spikes in energy costs—specifically, abrupt jumps in the price of oil. Understanding this dependence, the oil industry was shaken by a speech in 1956 by M. King Hubbert, a prominent geophysicist at Shell Oil. When a company moves into a field, it grabs the easy, cheap oil first. Tapping the rest gets progressively more difficult and expensive. Eventually, Hubbert observed, conditions get so tough that production levels off—it peaks. After the peak, decline is unstoppable, the fall as ineluctable as the rise. Hubbert used his theory to predict that the crude-oil yield in the continental United States would flatten between 1965 and 1970 (he didn’t include Alaska and most offshore oil areas). Coming at a time when estimates by the U.S. Geological Survey and the petroleum industry were constantly rising, this claim was derided; indeed, Hubbert claimed that just before giving his speech, a Shell official tried to get him to back off. Hubbert, not the least self-confident of men, stood his ground, even after he left Shell and in 1964 went to work for the Geological Survey. Unluckily for him, his most prominent critic was now his boss: Vincent E. McKelvey, a long-serving geologist at USGS who would become its director in 1971. As the University of Iowa historian Tyler Priest has documented, McKelvey’s USGS issued a stream of optimistic assessments about the country’s oil future. So did its counterparts in the oil industry. Meanwhile, Hubbert cranked out papers taking the opposite stance, none of them published by the Geological Survey. Inevitably, the dispute grew personal. Three days after McKelvey became the USGS director, he took away Hubbert’s secretary, a harsh measure in the days before e‑mail. According to Priest, Hubbert ended up having to write all his correspondence in longhand; his wife typed his reports at home. Hubbert struck back by helping to kill McKelvey’s nominations to the National Academy of Sciences and the American Academy of Arts and Sciences. Hubbert’s message of scarcity resonated at a time when the United States was haunted by the specter of Middle Eastern oil blockades. In a nationwide address, President Carter proclaimed that the planet’s proven oil reserves could be consumed “by the end of the next decade.” To forestall the disaster, he fired a volley of energy-efficiency measures: gas-mileage regulation, home-appliance energy standards, conservation tax credits, subsidies for insulation and weatherization. Congress enacted incentives and restrictions to induce industry to switch from supposedly scarce oil and natural gas to coal, which the U.S. has in abundance. Alas, petroleum firms found so much crude oil in the 1980s that by the 1990s, prices (after adjusting for inflation) had fallen to one-fifth of what they had been during the Carter administration. Estimates of reserves rose and rose again. Energy conservation faltered; oil and gas were too cheap to be worth saving. The argument has nonetheless continued, pessimists and optimists hammering at each other like Montagues and Capulets. Most of the Hubbertians are physical scientists; most of the McKelveyans, social scientists. Central to the conflict is their differing concepts of a reserve. Recall, as an example, the Kern River field. Its thousands of nodding pumps are siphoning up oil so thick and heavy that it almost doesn’t float on water. Although drillers knew from the first that the field was abundant, they could barely wrest any of this goop from the ground, a factor reflected in the first estimate of the reserve (47 million barrels of recoverable oil). Between that estimate and the second (697 million barrels), engineers developed a precursor to fracking: shooting hot steam down Kern River wells to thin the oil and force it out of the stone. At first, the process was hideously inefficient: heating the water to produce the steam required as much as 40 percent of the oil that came out of the wells. Burning unrefined crude oil released torrents of pollution: nitrous oxide, sulfur dioxide, carbon dioxide. But it squeezed out petroleum that had seemed impossible to reach. At the same time, the industry learned how to burrow farther into the Earth, opening up previously inaccessible deposits. In 1998, an oil rig near the Kern River field drilled thousands of feet deeper than any previous attempt in the area. At 17,657 feet, the well blew out in a classic gusher. Flames shot 300 feet in the air. The blast destroyed the well and everything else on the site. Even after the fire burned out, petroleum flooded from the hole for another six months. Energy firms guessed that the blowout hinted at the presence of big new oil-and-gas deposits. Earlier assessments had missed them because of their great depth. Investors rushed in and began to drill. To McKelveyan social scientists, such stories demonstrate that oil reserves should not be thought of as physical entities. Rather, they are economic judgments: how much petroleum experts believe can be harvested from given areas at an affordable price. Even as companies drain off the easy oil, innovation keeps pushing down the cost of getting the rest. From this vantage, the race between declining oil and advancing technology determines the size of a reserve—not the number of hydrocarbon molecules in the ground. Companies that scrambled to follow the Kern River gusher found millions of barrels of deep oil, but it was mixed with so much water that they couldn’t stop the wells from flooding. Within a few years, almost all the new rigs ceased operation. The reserve vanished, but the oil remained. This perspective has a corollary: natural resources cannot be used up. If one deposit gets too expensive to drill, social scientists (most of them economists) say, people will either find cheaper deposits or shift to a different energy source altogether. Because the costliest stuff is left in the ground, there will always be petroleum to mine later. “When will the world’s supply of oil be exhausted?” asked the MIT economist Morris Adelman, perhaps the most important exponent of this view. “The best one-word answer: never.” Effectively, energy supplies are infinite. More important, to Verleger’s way of thinking, the peak-oil battle has become irrelevant. Verleger, a former economic official in the Ford and Carter administrations, is now a visiting fellow at the Peterson Institute for International Economics in Washington, D.C. Since Hubbert’s time, the dispute has focused on “conventional” petroleum, the type found in regular oil wells, most of which is in the Middle East and controlled by OPEC. Production of conventional oil has indeed plateaued, as Hubbertians warned: OPEC’s output has remained roughly flat since 2005. In part, the slowdown reflects the diminishing supply of this kind of oil. Another part is due to the global recession, which has stalled demand. But a third factor is that OPEC’s conventional petroleum is being supplemented—and possibly supplanted—by what the industry calls “unconventional” petroleum, which for the moment mainly means oil and natural gas from fracking. Fracking, Verleger says, is creating “the biggest change in energy in almost 100 years—a revolution.” That revolution, in his view, will have a big winner: the United States. The argument is simple. The need to import expensive foreign oil has been a political and economic burden on the United States for decades. Today, though, fracking is unleashing torrents of oil in North Dakota and Texas—it may create a second boom in the San Joaquin Valley—and floods of natural gas in Pennsylvania, West Virginia, and Ohio. So bright are the fracking prospects that the U.S. may become, if only briefly, the world’s top petroleum producer. (“Saudi America,” crowed The Wall Street Journal. But the parallel is inexact, because the U.S. is likely to consume most of its bonanza at home, rather than exporting it.) Oil may cost more than in the past, but prices will surely stabilize. No more spikes! Still more important, this nation is fracking so much natural gas that its price today is less than a third of its price in Europe and Asia—a big cost advantage for American industry. As companies switch to cheap natural gas, a Citigroup report argued last year, the U.S. petroleum boom could add as much as 3.3 percent to America’s GDP in the next seven years. Largely because of little-noticed research by government agencies and small companies, that goal is within sight, says Leonardo Maugeri, a former director of the petrochemical division of the Italian energy firm Eni. The United States will still import oil, he argued last summer in a report from Harvard’s Kennedy School of Government. But domestic production will increase so much that by 2020, all of this country’s oil needs “theoretically could come entirely from the Western Hemisphere.” Within a decade, in other words, the U.S. could, if it wanted, stop importing oil from the Middle East. In November, the International Energy Agency agreed, though it pushed the date of independence to 2035. The fracking-led oil-and-gas boom, Philip Verleger said in January, will lead to an American “economic Renaissance.” The United States will at last escape the world made by Churchill, at least for a while. Nations like Japan, China, and India will still be stuck in that world, as will much of Europe and Southeast Asia. Many of these nations do not have shale deposits to frack, the requisite technological base, or, even if they have both the shale and the technology, the entrepreneurial infrastructure to finance such sweeping changes. Nonetheless, they want to be freed from their abrasive reliance on OPEC. The United States and Canada, mindful that the good times will not last forever, are also hunting for new supplies. All have been looking with ever-increasing interest at a still-larger energy source: methane hydrate. The land sheds organic molecules into the water like a ditchdigger taking a shower. Sewage plants, fertilizer-rich farms, dandruffy swimmers—all make their contribution. Plankton and other minute sea beings flourish where the drift is heaviest, at the continental margins. When these creatures die, as all living things must, their bodies drizzle slowly to the seafloor, creating banks of sediment, marine reliquaries that can be many feet deep. Microorganisms feed upon the remains. In a process familiar to anyone who has seen bubbles coming to the surface of a pond, the microbes emit methane gas as they eat and grow. This undersea methane bubbles up too, but it quickly encounters the extremely cold water in the pores of the sediment. Under the high pressure of these cold depths, water and methane react to each other: water molecules link into crystalline lattices that trap methane molecules. A cubic foot of these lattices can contain as much as 180 cubic feet of methane gas. Most methane hydrate, including the deposit Japan is examining in the Nankai Trough, is generated in this way. A few high-quality beds accumulate when regular natural gas, the kind made underground by geologic processes, leaks from the earth into the deep ocean. However methane hydrate is created, though, it looks much like everyday ice or snow. It isn’t: ordinary ice cannot be set on fire. More technically, ice crystals are typically hexagonal, whereas methane-hydrate crystals are clusters of 12- or 14-sided structures that in scientists’ diagrams look vaguely like soccer balls. Methane molecules rattle about inside the balls, unable to escape. The crystals don’t dissolve in the sea like ordinary ice, because water pressure and temperature keep them stable at depths below about 1,000 feet. Scientists on the surface refer to them by many names: methane hydrate, of course, but also methane clathrate, gas hydrate, hydromethane, and methane ice. Estimates of the global supply of methane hydrate range from the equivalent of 100 times more than America’s current annual energy consumption to 3 million times more. A tiny fraction—1 percent or less—is buried in permafrost around the Arctic Circle, mostly in Alaska, Canada, and Siberia. The rest is beneath the waves, a reservoir so huge that some scientists believe sudden releases of undersea methane eons ago set off abrupt, catastrophic changes in climate. Humankind cannot tap into the bulk of these deep, vast deposits by any known means. But even a small proportion of a very big number is a very big number. Hydrates were regarded purely as laboratory curiosities until the 1930s, when a Texas petroleum researcher realized that they were clogging natural-gas pipelines in cold weather. Three decades later, exploration in Siberia revealed gelid bands of methane hydrate embedded in the tundra. Meanwhile, oceanographers were observing anomalies in sonar readings of the seafloor. Some areas of the bottom bounced sound waves back more sharply than one would expect from muddy sediment. It was like waving a flashlight in a dark room and being startled by the flash from a mirror. Three geologists suggested in 1971 that these reflective zones were layers of methane hydrate. Not until 1982 did researchers obtain a large chunk of methane hydrate—a three-foot section of a core sample. The gas inside was 99.4 percent methane. That year, the United States established a methane-hydrate research program. The investigation was a small, belated part of a global push into unconventional petroleum that had been spurred by the oil shocks of the 1970s. For civilians, understanding unconventionals is difficult, not least because of the taxonomic hodgepodge the industry uses to describe them: tar sands, tight oil, heavy oil, shale gas, coal-bed methane, shale oil, oil shale. (Exasperatingly, shale oil is different from oil shale.) All of these different flavors of petroleum are “unconventional” simply because in the past they were too hard to pull from the earth to be worth the bother. Nowadays technology has made many of them accessible. With the odd exception, unconventionals can be broken into two rough categories: forms of petroleum that are heavier and less refined than the crudest of crude oil, and forms that are lighter and more refined than crude oil. Both are worth huge sums and entangled in dispute, much like conventional petroleum. But the second category, which includes the natural gas from methane hydrate, seems likely to play a much larger role in humankind’s future—economically, politically, and, most of all, environmentally. The first, heavy category consists of petroleum that must be processed on-site to be transformed into oil. Tar sands, for instance, consist of ordinary sand mixed with bitumen, a sludgy black goo that hasn’t withstood enough geological heat and pressure to be converted fully into ordinary oil. The most important tar-sand deposits are underneath an expanse of subarctic forest in central Canada that is roughly the size of England; they make up the third-biggest proven oil reserve in the world. In most cases, mining tar sands involves drilling two horizontal wells, one above the other, into the bitumen layer; injecting massive gouts of high-pressure steam and solvents into the top well, liquefying the bitumen; sucking up the melted bitumen as it drips into the sand around the lower well; and then refining the bitumen into “synthetic crude oil.” Refining in this case includes removing sulfur, which is then stored in million-ton, utterly useless Ozymandian slabs around mines and refineries. Conveying tar-sands oil to its biggest potential markets, in the United States, will involve building a huge pipeline from Alberta to Texas, which has attracted vituperative opposition from environmental groups and some local governments. The U.S. State Department has long delayed issuing permits to allow this pipeline to cross the border, a stall that has outraged energy boosters, who charge that the Obama administration is spitting in the soup of Canada, America’s most important ally. The boosters say little about the two 100 percent Canadian pipelines—one to shoot tar-sands oil to a port in British Columbia, a second to Montreal—that 100 percent Canadian opposition has stalled. All the while, indigenous groups in central Canada, people armed with special powers granted by the Canadian constitution, have carpet-bombed tar-sands country with lawsuits. Regardless of the merits of the protesters’ arguments, it is hard to believe that they will be completely ineffective, or that tar-sands oil will flow freely anytime soon. Much more prominent is the second unconventional category, the most important subcategory of which is the natural gas harvested by fracking shale. Every few years, the U.S. government produces a map of American shale beds. Flipping through a time series of these maps is like watching the progress of an epidemic—methane deposits pop up everywhere, and keep spreading. To obtain shale gas, companies first dig wells that reach down thousands of feet. Then, with the absurd agility of anime characters, the drills wriggle sideways to bore thousands of feet more through methane-bearing shale. Once in place, the well injects high-pressure water into the stone, creating hairline cracks. The water is mixed with chemicals and “proppant,” particles of sand or ceramic that help keep the cracks open once they have formed. Gas trapped between layers of shale seeps past the proppant and rises through the well to be collected. Water-assisted fracturing has been in use since the late 1940s, but it became “fracking” only recently, when it was married with horizontal drilling and the advanced sensing techniques that let it be used deep underground. Energy costs are surprisingly small; a Swiss-American research team calculated in 2011 that the average EROEI for fracked gas in a representative Pennsylvania county was about 87—about six times better than for Persian Gulf oil and 16 times better than for tar sands. (Fracking uses a lot of water, though, and activists charge that the chemicals contaminate underground water supplies.) Because of fracking, U.S. natural-gas reserves have jumped by almost three-quarters since 2000. As Economics 101 would predict, the arrival of vast quantities of methane from fracking has already made U.S. natural-gas prices plummet. In response, hundreds of wells have shut down, preserving methane deposits that can be tapped someday in the future. But U.S. natural-gas production has hardly been affected. Neither has demand: more and more industries, attracted by low prices, are switching to gas from oil and coal—especially coal. Today, a fifth of U.S. energy consumption is fueled by coal, mainly from Appalachia and the West, a long-term energy source that has provided jobs for millions, a century-old way of life—and pollution that kills more than 10,000 Americans a year (that estimate is from a 2010 National Research Council study). Roughly speaking, burning coal produces twice as much carbon dioxide as burning the equivalent amount of natural gas. Almost all domestic coal is used to generate electricity—it produces 38 percent of the U.S. power supply. Fracking is swiftly changing this: in 2011, utilities reported plans to shut down 57 of the nation’s 1,287 coal-fired generators the following year. Largely in consequence, U.S. energy-related carbon-dioxide emissions have dropped to figures last seen in 1995. Since 2006, they have fallen more than those from any other nation in the world. Here I should confess to personal bias. Twelve years ago, a magazine asked me to write an article about energy supplies. While researching, I met petroleum geologists and engineers who told me about a still-experimental technique called hydraulic fracturing. Intrigued, I asked several prominent energy pundits about it. All scoffed at the notion that it would pay off. To be fair, some early fracking research was outlandish; three early trials involved setting off atomic weapons underground (they did produce natural gas, but it was radioactive). I don’t want to embarrass anyone I spoke with. I failed to exercise independent judgment, and did not mention hydraulic fracturing in my article, so I was just as mistaken. But I also don’t want to miss the boat again. Even though plenty of experts discount methane hydrate, I now am more inclined to pay attention to the geologists and engineers who foresee a second, fracking-type revolution with it, a revolution that—unlike the shale-gas rush, mostly a North American phenomenon—will ripple across the globe. Japan, which has spent about $700 million on methane-hydrate R&D over the past decade, has the world’s biggest hydrate-research program—or perhaps that should be programs, because provincial governments on Japan’s west coast formed a second hydrate-research consortium last year. (Several researchers told me that the current towel-snapping between Beijing and Tokyo over islands in the East China Sea is due less to nationalistic posturing than to nearby petroleum deposits.) In mid-March, Japan’s Chikyu test ended a week early, after sand got in the well mechanism. But by then the researchers had already retrieved about 4 million cubic feet of natural gas from methane hydrate, at double the expected rate. Japan’s Ministry of Economy, Trade, and Industry is eager to create a domestic oil industry; at present, the nation produces just one one-thousandth of its own needs. Perhaps overoptimistically, the ministry set 2018 as a target date for commercializing methane hydrate. India and South Korea are following along, each spending as much as $30 million a year on hydrate experiments; the Korean program is growing especially aggressively. By contrast, the U.S. Department of Energy program is small—its annual budget is about $15 million, most of which is devoted to basic research on gas hydrates’ formation and location. About $2.4 million goes to U.S. Geological Survey methane-hydrate researchers, who have been test-mining onshore deposits in frigid Alaska and northwestern Canada. 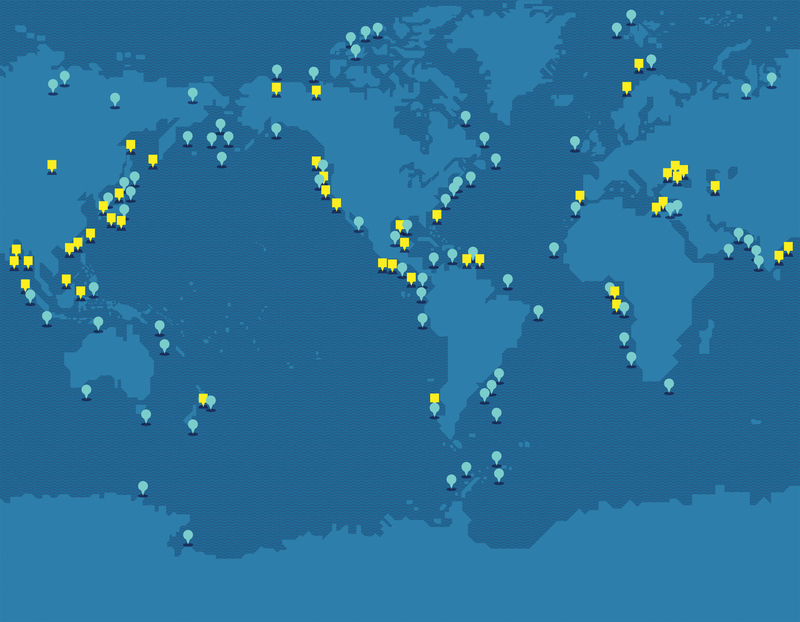 Based in Woods Hole, Massachusetts, and Denver, Colorado, the USGS program has about eight full-time researchers, as well as collaborators from Japan, Canada, Germany, India, and several oil companies. If one nation succeeds in producing commercial quantities of undersea methane, others will follow. U.S.-style energy independence, or something like it, may become a reality in much of Asia and West Africa, parts of Europe, most of the Americas. To achieve this dream, history suggests, subsidies to domestic producers will be generous and governments will slap fees on petroleum imports—especially in Asia, where dependence on foreign energy is even more irksome than it is here. In addition to North America, the main sources of conventionally extracted natural gas are Russia, Iran, and Qatar (Saudi Arabia is also an important producer). All will feel the pinch in a methane-hydrate world. If natural gas from methane hydrate becomes plentiful and cheap enough to encourage nations to switch from oil, as the Japanese hope, the risk pool will expand to include Brunei, Iraq, Nigeria, the United Arab Emirates, Venezuela, and other petro-states. Some scholars today doubt how much the Netherlands was actually affected by Dutch disease. Still, the general point is widely accepted. A good modern economy is like a roof with many robust supporting pillars, each a different economic sector. In Dutch-disease scenarios, oil weakens all the pillars but one—the petroleum industry, which bloats steroidally. Shortfalls in oil revenues thus kick away the sole, unsteady support of the state—a cataclysmic event, especially if it happens suddenly. “Think of Saudi Arabia,” says Daron Acemoglu, the MIT economist and a co-author of Why Nations Fail. “How will the royal family contain both the mullahs and the unemployed youth without a slush fund?” And there is nowhere else to turn, because oil has withered all other industry, Dutch-disease-style. Similar questions could be asked of other petro-states in Africa, the Arab world, and central Asia. A methane-hydrate boom could lead to a southwest-to-northeast arc of instability stretching from Venezuela to Nigeria to Saudi Arabia to Kazakhstan to Siberia. It seems fair to say that if autocrats in these places were toppled, most Americans would not mourn. But it seems equally fair to say that they would not necessarily be enthusiastic about their replacements. Augmenting the instability would be methane hydrate itself, much of which is inconveniently located in areas of disputed sovereignty. “Whenever you find something under the water, you get into struggles over who it belongs to,” says Terry Karl, a Stanford political scientist and the author of the classic The Paradox of Plenty: Oil Booms and Petro-States. Think of the Falkland Islands in the South Atlantic, she says, over which Britain and Argentina went to war 30 years ago and over which they are threatening to fight again. “One of the real reasons that they are such an issue is the belief that either oil or natural gas is offshore.” Methane-hydrate deposits run like crystalline bands through maritime flash points: the Arctic, and waters off West Africa and Southeast Asia. In a working paper, Michael Ross and a colleague, Erik Voeten of Georgetown University, argue that the regular global flow of petroleum, the biggest commodity in world trade, is also a powerful stabilizing force. Nations dislike depending on international oil, but they play nice and obey the rules because they don’t want to be cut off. By contrast, countries with plenty of energy reserves feel free to throw their weight around. They are “less likely than other states to sign major treaties or join intergovernmental organizations; and they often defy global norms—on human rights, the expropriation of foreign companies, and the financing of foreign terrorism or rebellions.” The implication is sobering: an energy-independent planet would be a world of fractious, autonomous actors, none beholden to the others, with even less cooperation than exists today. None of this is what makes Christopher Knittel use words like catastrophe. What Knittel is thinking of is, so to speak, the little black specks of Yulin, China. Five years ago, I traveled with a friend to Yulin, in the northwestern province of Shaanxi, not far from Mongolia. We visited the Great Wall, which passes just north of town. In that area, the wall itself had mostly crumbled to nothing, except for the watchtowers, which stuck up every half mile or so. People in one tower were supposed to be able to signal to the next, passing on messages like ships at sea. When I climbed up one eroded tower, I was surprised to find that I couldn’t see its neighbor. There were little black specks all over my glasses. I cleaned the lenses, but was still unable to make out the next tower. The black specks were not just on my glasses. Walking around town, my friend and I had noticed that almost every home had a pile of coal outside, soft dark chunks that people shoveled into stoves for cooking and heating. Thousands upon thousands of coal fires were loading the air with tiny dots of soot. Scientists have taken to calling these dots “black carbon,” and have steadily ratcheted up their assessments of its harm. In March, for instance, a research team led by a Mumbai environmental group estimated that black carbon and other particulate matter from India’s coal-fired power plants cause about 100,000 deaths a year. Environmentalists worry even more about black carbon’s role in climate change. Black carbon in the air absorbs heat and darkens clouds. In some places, it alters rain patterns. Falling on snow, it accelerates melting. A 31-scientist team from nine nations released a comprehensive, four-year assessment in January arguing that planetary black-carbon output is the second-biggest driver of anthropogenic (human-caused) climate change; the little black specks I found on my glasses and clothes have roughly two-thirds the impact of carbon dioxide. The Chinese government is aware of this, which is one reason it is pursuing both shale gas and methane hydrate. But environmentalists are less enthusiastic than one might imagine about the prospect of weaning ourselves from coal with gas. The reason is that methane itself—unburned natural gas—has a much greater capacity to trap solar heat than carbon dioxide does. (Because methane does not remain in the air as long as carbon dioxide, the precise comparison depends on the chosen time frame; researchers typically say that methane is about 20 or 30 times more potent.) Activists fear that the negative effects of obtaining natural gas could swamp the positive effects of burning it. They are entirely correct, although perhaps not in the way they suppose. The real concern, Ruppel and other researchers told me, is less an explosive methane release from under the Earth’s surface—the environmental disaster that might have caused havoc eons ago—than a slow discharge at ground level, from the machinery that will pull methane hydrate out of the seafloor. The problem already exists with fracking. “The rule of thumb is that if a well leaks more than about 3 percent” of its methane production into the air, “natural gas actually becomes dirtier than coal, from a climate-change perspective,” says Ramez Naam, the author of The Infinite Resource, a just-published book about the race between environmental degradation and technological innovation. “The amazing thing, though, is that we don’t have any data—nobody is required to monitor methane at the well. So there’s just a few studies, which vary tremendously.” Worse still, the aging natural-gas infrastructure is riddled with holes and seeps; early this year, a survey of gas mains along Boston’s 785 miles of road, the first-ever such examination, found 3,356 leaks. Last August, the Environmental Protection Agency amended the Clean Air Act to require well operators to recapture some methane; because nobody knows how much natural gas is gushing into the air, the new rules’ impact is uncertain. What we can’t do, or at least not readily, is overcome the laws of economics. In these visions of the future, natural gas plays two roles. To politicians and economists, it is a vehicle for reasserting American might—cheap energy that will liberate the United States from foreign petroleum. To environmentalists, natural gas is a bridge fuel, a substitute for coal and oil that will serve until—but only until—the world can move to zero-carbon energy sources: sunlight, wind, tides, waves, and geothermal heat. In the short run, these visions are compatible. Although the cost of renewable energy is falling rapidly, it is not yet equivalent to the cost of energy from fossil fuels. As an example, typical solar cells today have an EROEI of about 10—better than tar sands but worse than most oil and gas. (All such estimates are rough in the extreme, because the output of renewables, unlike that of petroleum, depends on where they are located. One recent estimate put the EROEI of Spain’s extensive solar-power network at less than 3.) Many advocates for solar power believe that its EROEI will match that of fossil fuels within a decade. Even if they are correct, though, sunlight is too fickle and inconstant for utilities. Modern electrical grids are in some ways like busy airports, with sweaty controllers staring at monitors, feverishly adjusting power outputs from big plants to the capricious swirls of human demand for air-conditioning, baseboard heating, and microwave popcorn. As more and more energy comes from sun, wind, tides, and other variable sources, the problem of balancing fluctuating supply and fluctuating demand will worsen. When renewables supply 20 to 30 percent of all electricity, many utility-energy engineers predict, the system will no longer be able to balance supply and demand. Brownouts will ripple across the landscape; control centers will call up big companies and beg them to turn off the lights; managers of ultrasensitive modern control centers will watch in horror as voltage drops lead to factory shutdowns. (Germany, a leader in renewable-energy use, is already facing this situation.) To ask utilities to take in large amounts of solar power—electricity generated by hundreds or thousands of small installations, many on neighborhood roofs and lawns, whose output is affected by clouds—is like asking a shipping firm to replace its huge, professionally staffed container ships with squadrons of canoes paddled by random adolescents. Other renewables can be more reliable than power from the sun, to be sure, but all are costlier than petroleum and hard to fit into today’s grid. Natural gas, from this point of view, seems like the perfect stopgap. The clash occurs when renewables are ready for prime time—and natural gas is still hanging around like an old and dirty but reliable car, still cheap to produce and use, after shale fracking is replaced globally by undersea mining of methane hydrate. Revamping the electrical grid from conventionals like coal and oil to accommodate unconventionals like natural gas and solar power will be enormously difficult, economically and technically. Facilities must be constructed to store extra energy for dark, windless days; transmission lines will need to be built to move power from warm places like New Mexico to cold places like New England; grids will have to be reworked to allow small energy producers to share directly with neighbors rather than being forced to pump everything into large power centers. All of this will be a burden on businesses and consumers alike. But it must be done to avert climate change, because electricity generation is responsible for about a third of America’s greenhouse-gas emissions. Roughly similar figures hold true in other developed nations. Most oil specialists agree that humankind is naturally progressing toward a no-carbon energy future. Our species has already moved from wood to coal to oil to gas, each fuel burning cleaner than its predecessor. Wind, solar, and other renewables are obvious next steps. The problem, scientists say, is that climate change is happening too quickly. Instead of evolving over decades, as happened with the building of the electrical grid, the changeover to renewables has to occur now, faster than any change before. True, there are ways of buying time. Scientists have experimented, for instance, with injecting carbon dioxide into methane hydrate; for complex chemical reasons, the crystals “prefer” the carbon dioxide, taking it in and expelling natural gas. If undersea methane hydrate could be mined in this fashion, the sequestered carbon dioxide, forever imprisoned in ice beneath the waves, would offset some emissions. This new kind of carbon sequestration could ameliorate some of the long-term environmental damage that widespread global use of cheap natural gas from methane hydrate will do. But even if such techniques work in the way researchers hope, the infrastructure transformation ahead is daunting in scale and scope. It’s like setting up a second Industrial Revolution, only all over the world and in one-third the time. Smil is correct—the sort of rapid energy transition we need has never occurred before. At the same time, one should note that no physical law says these transitions must be slow. Societies have changed rapidly, even when it cost a lot of money. Nobody can predict the future, but it is dumbfounding to hear left and right alike bemoaning the “reality” that society cannot change, particularly at a time when both sides are bemoaning the consequences of convulsive social change. Natural gas, both from fracking and in methane hydrate, gives us a way to cut back on carbon emissions while we work toward a more complete solution. It could be a useful crutch. But only if we have the wit to know that we will soon have to lay it down.